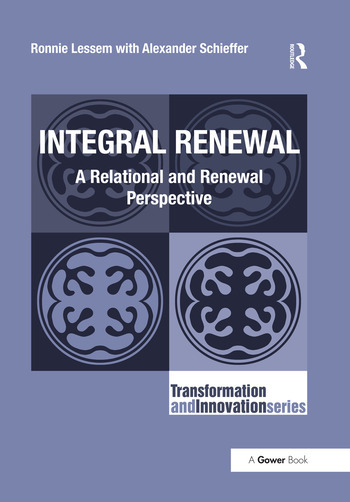 In 2010 Ronnie Lessem and Alexander Schieffer published their seminal work on Integral Research and Innovation, whereby they identified the four R’s; relational and renewal, reason and realization based research paths that altogether encompass the major qualitative research methods and methodologies. Within each path they identified a trajectory from origination to transformation via foundation and emancipation. However these paths, underlying the research process, conventionally termed 'method', were disconnected from the integral economic and enterprise content, conventionally termed 'literature', with which they were concerned. In this book, Integral Renewal they seek to remedy such, in two major respects. As transformative masters and PhD programs are focused on the 'Global South', where the vast majority of the world’s population is based, as well as those developmental agencies focused on such, the great majority of the people with whom the authors deal select the relational research path, and the path of renewal, over and above the paths of reason and realization. The focus of this book will be on these two paths of integral research, now interconnected with integral enterprise and economics. Uniquely, the authors pursue research and innovation in a systematic way. In that respect, while their prior Integral Research book still provides the research foundation for the four southern and eastern, northern and western paths, this book will focus on the former two relational (southern) and renewal (eastern) from the combined perspectives of research process and economic and enterprise content. Ronnie Lessem was born in Zimbabwe of central European parentage, and graduated from Harvard Business School and the London School of Economics. He has written some 30 books, the last six together with Alexander Schieffer, on self, organizational and societal development from a transcultural, transformational perspective. He has also been an international management consultant in Europe and America, India and Africa for three decades. Alexander Schieffer co-founded, with Ronnie Lessem, TRANS4M Center for Integral Development (Geneva), designed to (r)evolutionize education, research and development. Trans4m’s cutting edge programs provide innovative culture-specific responses to burning socio-economic issues. Born in Germany, Schieffer gained his PHD from the University of St. Gallen, Switzerland, where he lectures in International Development.